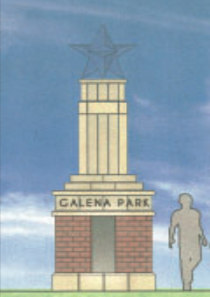 ARTISTS RENDERING of the new Galena Park Gateway Monument. It will stand over 20 feet tall, and be lit with a blue light for the star. GALENA PARK – Work is underway on the construction of a “Gateway” monument, marking the entrance to Houston through the Port. This is one of nine similar gateway projects, paid for primarily by the EconomicAlliance, a consortium of Ship Channel industries. The Alliance provided each community with a $125,000 grant, and a matching grant of $25,000 was required. Each gateway design is different, related to the community in which they are built. Design work was by Bryan Janhsen of Knudsen landscape architects. Also planned is a plaza with statues honoring Veterans, Firefighters, and Police. MARC CHAPA displays his winning Grand Champion Steer last Saturday at the FFA Auction. K & T Western Wear bought the steer for $3600. 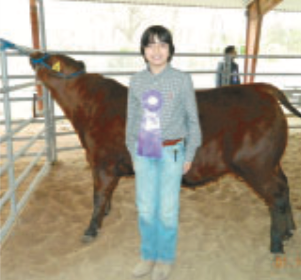 SHELDON – The 59th annual Sheldon FFA Livestock Show was held last Saturday at the Ag Center on Beaumont Highway. Students showed a total of 32 animals or projects, down from 36 the year before. The Grand Champion Steer, shown by Marc Chapa,was purchased for $3600 by K & T Western Wear of Channelview, who were also the high buyer at the show. The Grand Champion Swine was purchased by North Shore Rotary for $2000. The exhibitor was Samantha Doerr. School advisors for the FFA are Chris Jones, Stephanie Jones, Amanda Langley, Robert Lewis and Bobby Locke. Denise Smesny is CTE Director. A complete presentation of exhibits will be featured in an upcoming issue of the North Channel Star. Firefighters with the Channelview Fire Department received a more than $4,000 grant for fire prevention. The grant will be used for education in the community on matters of fire safety, and to reduce the number of fires. CHANNELVIEW, Texas— The Channelview Fire Department has received a US$4,405 fire prevention grant from FM Global, one of the world’s largest commercial property insurers. 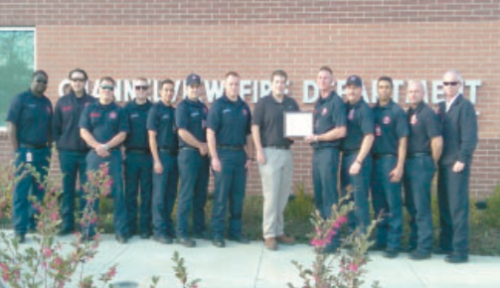 FM Global representatives presented the award to Channelview Fire Department at Station 1 located at 16229 Market Street in Channelview Texas. The award will be used to assist with fire prevention activities in the community to help educate the community and reduce the number of fires. Because fire continues to be the leading cause of property damage worldwide, during the past 35 years FM Global has contributed millions of dollars in fire prevention grants to fire service organizations around the globe. Locally, the company has awarded grants to a number of Texas-based organizations. The funds will be used to purchase a Surface Pro Laptop, Overhead projector, and a Sparky the Fire Dog costume. 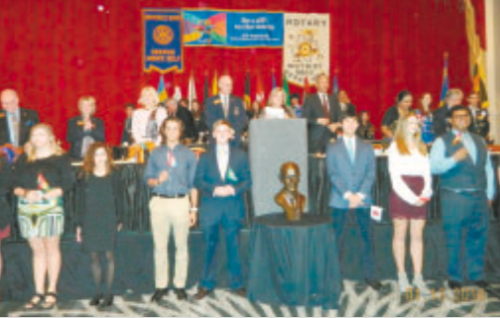 Districts 5890 and 5910 held their All-Club meeting at the Sheraton Hotel near the NRG Stadium on Tuesday January 12th. Almost 500 Rotarians and wives of the 3000 in Houston attended the event. District Governors Nick Giannone of 5890 and Doris Lockey of 5910 were the official hosts. Honored guest was Rotary International President K. R. Ravin-Dran and his wife. The president is a native of Sri Lanka. Entertainment for the evening included two dance numbers by the Ratini Dance Company of Sri Lanka. 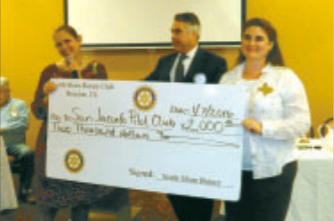 ACKNOWLEDGING THE WORK that the Pilot Club does for the community, the North Shore Rotary club donated to support them in upcoming projects. Pictured: Joan Van Fleet, PIlot Club president; Mike Williams, Rotary president; and Julie Fallin, past Pilot Club president. Current projects are Hug-A-Heart and helmets for bicycle riders.